Mid-East Natural Goatskin Drum Head 36 Inch Thin. 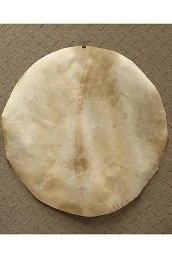 Flat round piece of natural goatskin. All skins sold "AS IS". We do our best to eliminate skins that have possible defects; however, our prices are based on an "as is" basis. This means, on average, you can expect to lose one out of ten skins. Obviously the tightness during installation will alter this ratio, so figure this loss in your cost. Do NOT Over Soak: You do not have to soak this skin as long as you may think! Please start by soaking in fresh warm water only five minutes. If this is not enough time, continue to soak the skin, but check often. Over soaking the skin past pliable will breakdown the skin and render it unusable. All skins are carefully checked prior to shipping. Unfortunately, not all defects are visible. Approximately 1 out of 10 skins will have an unseen defect. For more details contact Customer Support - we're here to help.